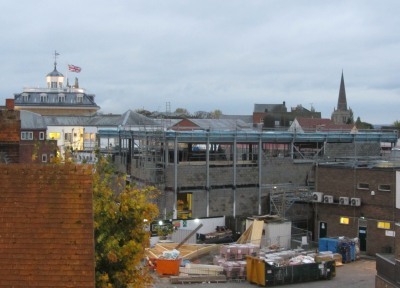 I often feel so lucky to be living in Abingdon with all of its waterside paths and views. The city and village where I grew up were deserts in comparison. I took this picture from Abingdon Bridge this evening looking back towards the Upper Reaches Hotel. 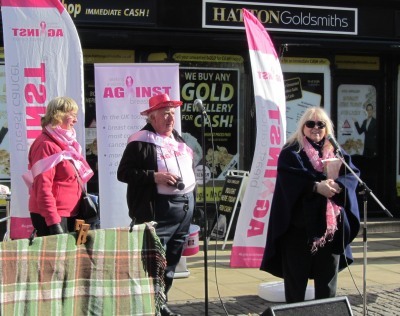 The end of month round up of pictures has more from the waters edge + Abingdon Marathon, Apple Day, Against Breast Cancer Day, and all the fun of the Abingdon Fair + organ fairground music. 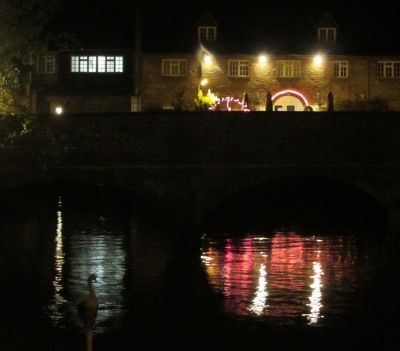 Which river famously flows through Abingdon-on-Thames? The competition closes on Fri, 31st May 2013 at 00:00 BST. 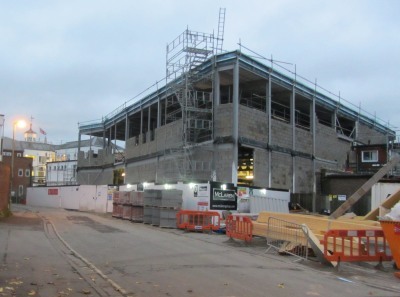 So the winner will be able to spend the token in one of the new stores that are taking shape at the Abbey Shopping Centre. 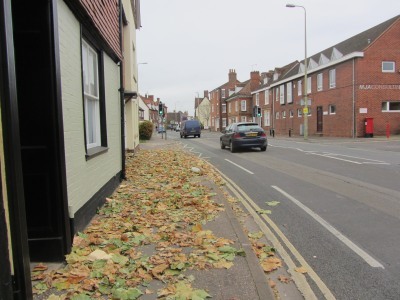 When I was walking down Conduit Road yesterday I thought somebody must have swept up the leaves under the Plain trees, but discovered they had all got blown round the corner into Ock Street. 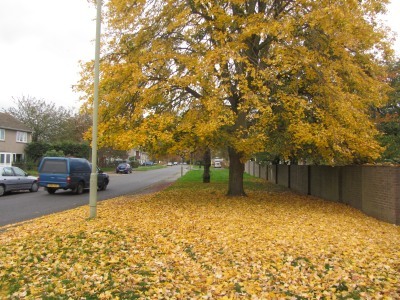 Temperatures have fallen and leaves have been falling from this tree on Preston Road. 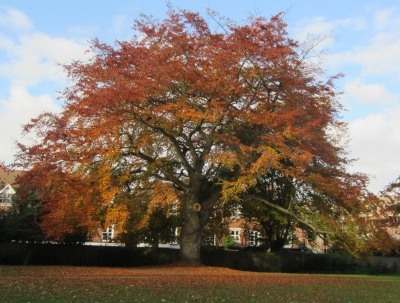 There are many magnificent autumn trees in Abingdon, but this one in the Abbey Gardens looks particularly good , despite loosing a large limb a few weeks ago, and despite the large care home being built behind. A group of 21, 17 female and 4 male, gathered in the King Charles Room, at the Kings Head and Bell, two hours before the fire walk. 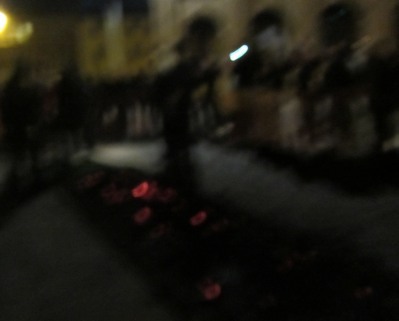 The Firewalk was to raise funds for Against Breast Cancer. The instructors explained that it could be dangerous, the embers over which we were to walk were burning at 1200 degrees Fahrenheit, so we needed to follow their instructions. Half way through the training we went to view the fire. It felt cold outside until we stood round the fire. 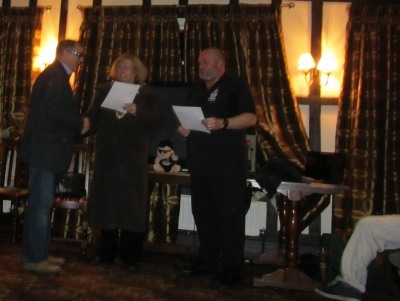 The Mayor presented certificates afterwards and said it was a cause close to her heart. Pat Leathem and she were theatre nurses at the Churchill Hospital where breast surgery was carried out. Dr Anthony Leatham used to ‘shake a tin’ at a tube station to raise money. The media got to hear about it and the publicity meant that Against Breast Cancer was started and Pat left to work with it full time. 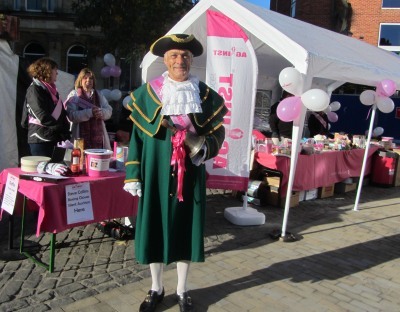 Against Breast Cancer had a special day on the Market Place, and around town, turning everything pink including the Town Crier’s bell. 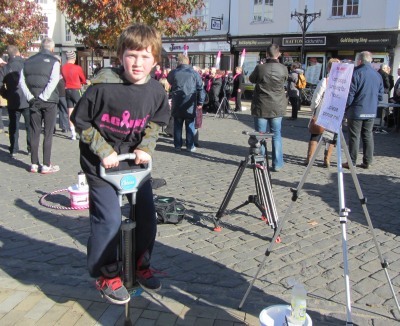 It was all to raise awareness and funds to fight Breast Cancer and this young lad did a sponsored hour long pogo stick jump – his mum is involved in the charity. 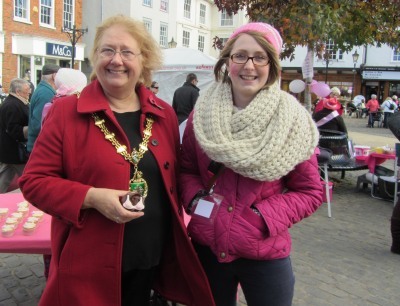 Emily seen here with the Mayor is one of the organisers. They brought in celebrities such as Kerry Kat ona who had a good crowd, Bobby Davro, Steve Collins the boxer, a group called The Soldiers, an Elvis and Rod Steward tribute act, and a choir called the Didcot Divas..
Also Dwina Gibb, the widow of Robin Gibb was there as patron of the charity. 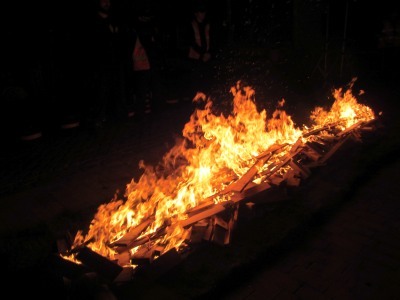 Tonight at 7:30 there will be a Firewalk on the market place – more of that anon.